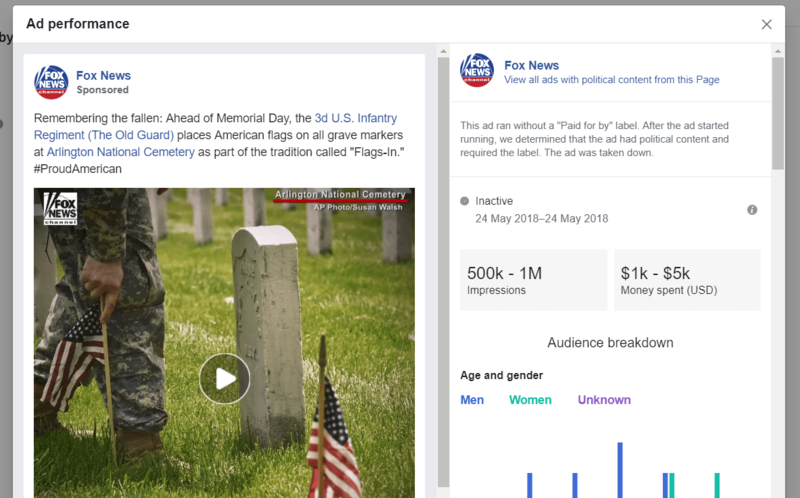 Facebook and Twitter have both just released new tools to check out all the ads an account might be running on their platform. It’s an eye-opener for sure, and a game changer when it comes to competitor research. They’ve been live for less than a week, and I’ve already ended up falling down an internet rabbit hole of unlimited depth peeping on other peoples’ campaigns. So allow me to take a five-minute breather to share 5 things you can learn from these new super-spy tools. This does take a bit of educated guessing, but by looking at what a page’s adverts are on Facebook, you can work out what organic content they’ve decided to put money behind to boost out of the algorithm’s harsh grasp. He’s a good dog Brent – and most likely a boosted organic post. How’s this valuable? 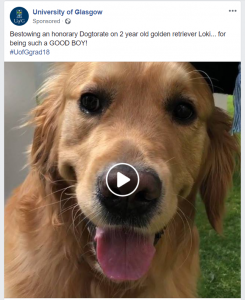 Well for starters, if you’re constantly comparing yourself against another page’s organic content on Facebook, you can now see why some of their posts do a lot better than similar content you post with no money. Tick 1 for sanity preservation and morale boosting. 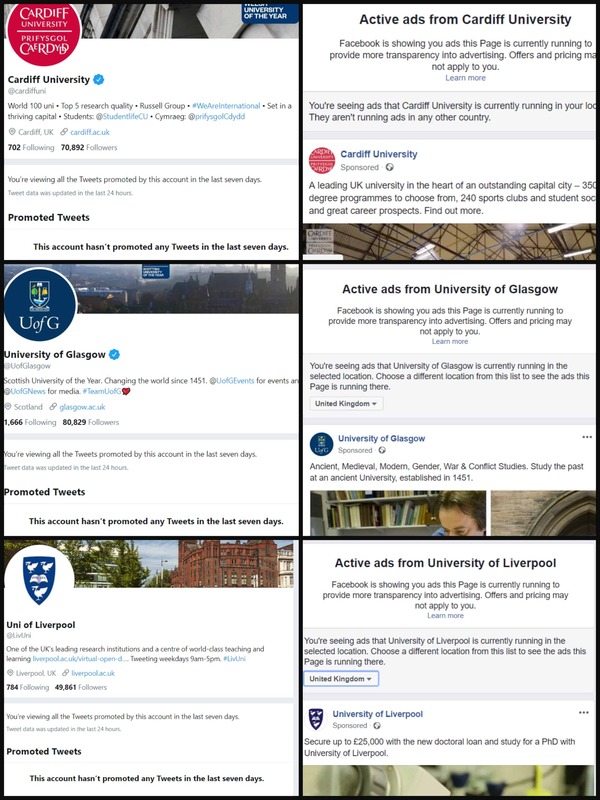 Sure Twitter’s tool only shows the past 7 days of ads, but when you compare the adverts of a Twitter account to what’s running on their Facebook page, it’s clear to see where people are wanting to put their money. Twitter to the left of me, Facebook to the right. Here I am stuck in the middle of a one sided advertising platform war. How’s this valuable? You can maybe stop worrying about not putting money on Twitter. Or maybe decide that’s an untapped market. What ever floats your boat. 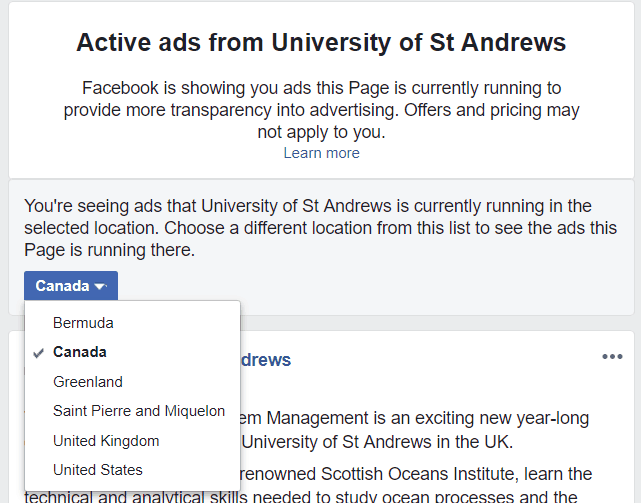 On Facebook you can also see a break down of what adverts a page is running by target countries. It might not be as detailed as showing the demographic targeting, but it’s still illuminating. How is this valuable? Cause with some industries this kind of information can show strategic priorities sales/recruitment. Links to this fancy pants paralex scrolling landing page. How is this valuable? 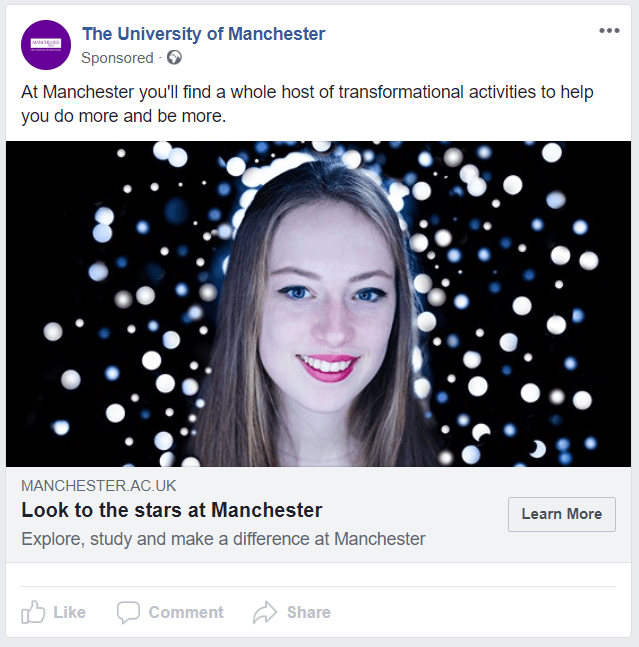 Because adverts are just part of the advertising game. Seeing what experience people are giving those that click on their adverts can help optimise your landing page game. Since all this transparency kicked off because of the 2016 US election and Brexit rather than Zucks getting a conscience, things get even more intense when it comes to political ads. You just need to know where to look. Or click the following link to get access to Twitter’s Ad Transparency tool. 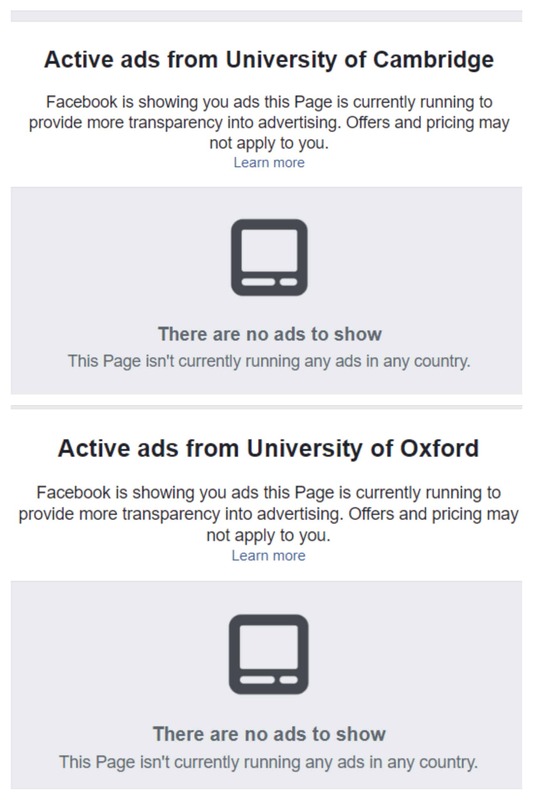 And then if you’re on a Facebook page, just click the “Info and Adverts” tab. Easy. 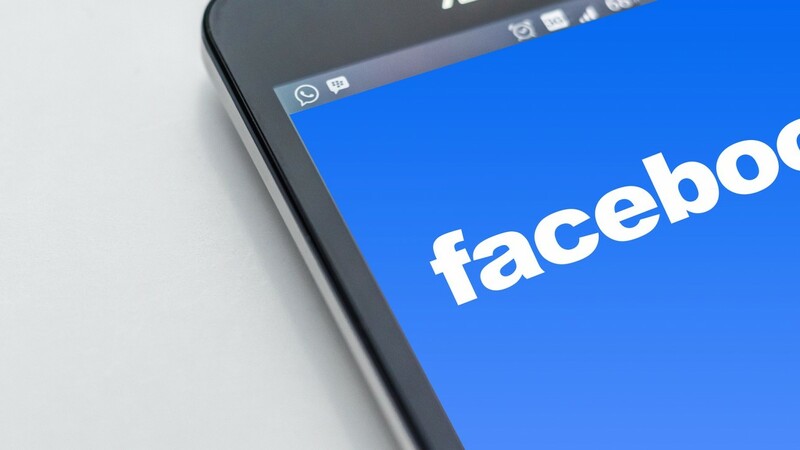 This is all good for social adverts, but what about online display adverts? Well thanks for a heads up from Sarah at the University of Missouri, there’s a tool for that too. Check out Moat and all it can do for you.